Meniscal lesions are commonly seen in the young athletic population due to the high strain put on the knee during movements like twisting, pivoting and cutting. There are many different types of lesions that can occur in the meniscus and other structures in the knee such as the anterior cruciate ligament are commonly injured along with the meniscus. Conservative treatment may be used for meniscal lesions however, due to the lack of blood supply to most of the meniscus, healing often takes a long time and surgery may be indicated. The menisci are two semi-lunar shaped pieces of cartilage that lie between the femoral condyles and the tibia in the knee. They serve to increase the concavity of the relatively flat tibial plateau in order for a better articulation with the femoral condyles1. 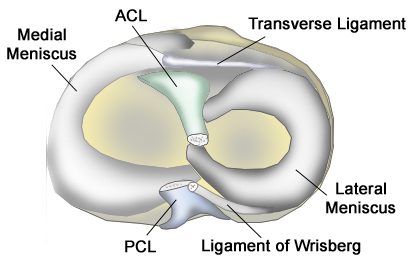 The lateral meniscus generally attaches to the anterior and posterior aspect of the tibial plateau and the joint capsule2, but some variants of the anatomy show that it attaches to the meniscofemoral ligaments of Wrisberg and Humphrey, as well as the popliteal ligament allowing it to have more motion than the medial meniscus3. Due to this movement, the lateral meniscus is more likely to follow the contours of the lateral femoral condyle and is therefore less likely to be injured than the medial meniscus which is firmly attached anteriorly and posteriorly to the tibia and joint capsule2. The blood supply to the meniscus is provided by the medial and lateral geniculate arteries, however only the outer 10-30% of the menisci is vascularized1. This is an important consideration when treating meniscus lesions because based on the location of the tear, the cartilage may take a greater amount of time to heal. There are three “zones” in the meniscus and they are classified based on the amount of blood supply to the area4. The “red-red zone” is located on the very outer edge of the meniscus and receives the most blood. The “red-white” zone is located in the middle 1/3 of the meniscus at the junction between the vascular and avascular portions of the meniscus. The “white-white” zone is the innermost aspect of the meniscus and comprises the avascular portion. The further out the lesion, the more likely the meniscus will heal4. Meniscal tears are fairly common knee injuries, especially in the athletic and active population. Each year, about 60 to 70 per 100,000 individuals sustain a meniscal tear with a higher incidence in males than females4. These injuries are often associated with injuries to the anterior cruciate ligament. Macrotraumatic injuries (acute trauma) to the meniscus occur most commonly in males between the ages of 21 and 30, and in females between 11 and 20 years old3. Microtraumatic injuries (degeneration) are seen most commonly in men 40-70 years old and in females consistently after 20 years old3. A detailed patient history is extremely helpful in determining the presence of a meniscal lesion. A patient’s description of his or her symptoms along with the mechanism of injury and select clinical tests have been shown to be more accurate than an MRI in diagnosing a meniscal tear5. The symptoms typically present in a patient with a meniscus tear are knee “catching” or “locking”, limited joint mobility about the knee, daily pain lasting more than one month, effusion (swelling), a feeling of instability in the knee and tenderness around the joint line5. The causes of meniscal injuries can be either macro-traumatic (meaning one acute event caused the injury) or micro-traumatic (meaning over time, repetitive small traumatic events led up to injury, or degenerative changed occurred to create injury). Micro-traumatic meniscal injuries have been linked to excessive kneeling For example, a person who kneels for work such as a floor layers are at a greater risk to sustain a micro-traumatic meniscal injury6. Macro-traumatic injuries to the meniscus are often sustained during pivoting, twisting while weight-bearing, or extreme valgus or varus force to the non-weight-bearing leg4. A medial meniscus lesion is often a concomitant injury associated with chronic ACL tears while a lateral meniscus lesion may be sustained during an acute ACL lesion4. A full knee exam should be performed when a meniscal lesion is suspected in order to rule in or rule out the presences of ligamentous injuries as well. The following tests have been shown to be the most reliable when diagnosing a meniscus lesion. However, it is important to note that not one single test by itself is reliable enough to definitively indicate the presence of a tear. One meta-analysis7 has found joint line tenderness to be the most accurate test in diagnosing meniscal pathology, but the most reliable diagnosis comes from a combination of performing joint line palpation, McMurray’s Test and Apley’s Compression test. MRI may also be used to aid in diagnosis of a meniscal lesion, but the accuracy of this exam is greatly debated5. The following test descriptions are gathered from Magee, 20088 and sensitivity/specificity values from an extensive literature review by Chivers, 20099. Note that the sensitivity and specificity values are gathered from many studies and are presented in a range due to the different results found by the studies. There is little evidence supporting an absolute value for this information. The examiner palpates along the tibiofemoral joint line as the patient is supine with the knee flexed to 90 degrees. A positive test is indicated by a pain response by the patient during palpation. Sensitivity: 55–95% Specificity: 15%-97%. The patient is supine with the examiner standing to the side of the table. The examiner passively flexes the patient’s knee to full flexion and as the examiner palpates the joint line, he or she medially rotates the tibia (to test the lateral meniscus) and extends the knee. The test is repeated with lateral rotation of the tibia in order to test the medial meniscus. A positive sign would be a snap or click felt by the examiner, or a pain response by the patient. Sensitivity: 16%-70% Specificity: 59%-98%. The patient lies supine on the table and the examiner stands to the side. The examiner cups the patient’s heel in one of his or her hands and supports under the patient’s knee with the other hand. The patient’s knee is then passively flexed, and the extended in one quick motion by the examiner releasing the hand that is supporting on the back of the knee. A positive sign is indicated by a sharp pain felt along the joint line which may radiate throughout the leg. Sensitivity: 36%-47% Specificity: 67%-86%. Nonoperative treatment of a meniscal tear is rarely effective in the young, highly active patient due to the slow healing time and necessity for the patient to return to sport4. However, conservative treatment may be indicated for middle-aged patients suffering from degenerative changes in the meniscus10. Conservative treatment consists of RICE (rest, ice, compression and elevation), non-steroidal anti-inflammatory drugs, as well as stretching and strengthening of the lower extremity muscles and proprioceptive exercises to minimize the biomechanical factors that may be adding to the degeneration of the meniscus4. In a prospective randomized trial, Herrlin et al.10 found that exercises such as calf raises, lunges, hamstring curls, long arc quads, stair walking, rocker board balance, stationary biking, and stretching of the knee flexors and extensors over an 8 week time period produced the same amount of improvement as arthroscopic surgery in a population of middle-aged patients with degenerative damage to the meniscus. It is important to note that surgery may still be indicated if conservative treatment is ineffective. Surgery for a torn meniscus is highly indicated if the patient experiences a completely locked knee due to a fragment of the meniscus impeding the motion3 or if the patient is highly active and must return to sport4. The approach to surgical repair of a torn meniscus has changed over the years. Previously, surgeons would completely remove the meniscus when it was torn (total meniscectomy), but over time, physicians realized that this caused more damage to the underlying cartilage and resulted in a higher incidence of osteoarthritis11. Surgery is performed using arthroscopic techniques and the most common methods are partial meniscectomy and arthroscopic repair which may be done using different suture techniques. The 3 most common techniques are inside-out, outside-in and all-inside11. Partial Meniscectomy: This method is used in place of a total meniscectomy and is indicated when the meniscus is too damaged for repair to be feasible. For example, when there are loose fragments that are impeding the joint’s movement, but are unable to be sutured back onto the rest of the meniscus. Arthroscopic Repair: This is the preferred method of surgical treatment of a meniscal tear as it preserves the meniscus and creates an optimal situation for the meniscus to heal. The three types of suture techniques are chosen based on the location of the tear and each surgeon’s preference. The inside-out technique is the most popular technique as it can be used to treat all types of tears. The disadvantages of this technique include the fact that an extra incision needs to be made and the neurovascular structures around the knee such as the peroneal nerve, popliteal artery, popliteal vein and tibial nerve on the lateral side, and branches of the saphenous nerve on the medial side are at risk of becoming damaged. Extreme skill is required in the positioning of the instruments in order to preserve these structures and reduce the chance of complications. The outside-in technique is most effective in repairing tears that occur in the anterior and middle 1/3 of the meniscus as it puts the neurovascular structures at less of a risk of injury that the inside-out technique for repairing the same type of tear. An all-inside technique may be chosen for an unstable tear of the posterior horn of the meniscus in a longitudinal vertical fashion. Goals of rehabilitation after a meniscal repair include decreasing pain and swelling, regaining full range of motion and strength, improve balance and returning to normal activity12. Patients are often mobilized quickly after surgery to increase range of motion and will begin weight-bearing exercises to reduce atrophy12. When a patient undergoes an ACL reconstruction at the same time as meniscal repair, he or she will likely follow the rehabilitation protocol designed for the ACL reconstruction, but may wear a brace that locks the knee into extension during weight-bearing and will be advised to avoid hyperflexion of the knee11. Weight-bearing in the extended position reduces the chance that the meniscus repair will fail because in flexion, the menisci undergo more shearing forces and have a greater chance of pulling the sutures apart12. A typical rehabilitation program will last about 8 weeks and will consist of closed-chain quadriceps strengthening, ankle pumps, electrical stimulation for muscle reeducation, and stretching for the first few weeks progressing to walking, swimming, stair climbing, and eventually running, jumping and plyometric training12. In order to return to sport-related activities, it is recommended that the patient achieve 120 degrees of flexion and 80% strength of the lower extremity as compared to the unaffected side12. 1. Messner K, Gao J. The menisci of the knee joint. anatomical and functional characteristics, and a rationale for clinical treatment. J Anat. 1998;193(2):161-178. 2. Greis P, Bardana D, Holmstrom M, Burks R. Meniscal injury: I. basic science and evaluation. J Am Acad Orthop Surg. 2002;10(3):168-176. 3. Rath E, Richmond JC. The menisci: Basic science and advances in treatment. Br J Sports Med. 2000;34(4):252-257. 4. Poulsen M, Johnson D. Meniscal injuries in the young, athletically active patient. The Physician and sportsmedicine. 2011;39(1):123-130. doi: 10.3810/psm.2011.02.1870. 5. Ercin E, Kaya I, Sungur I, Demirbas E, Ugras A, Cetinus E. History, clinical findings, magnetic resonance imaging, and arthroscopic correlation in meniscal lesions. Knee surgery, sports traumatology, arthroscopy. 2011. doi: 10.1007/s00167-011-1636-4. 6. Rytter S, Jensen L, Bonde J, Jurik A, Egund N. Occupational kneeling and meniscal tears: A magnetic resonance imaging study in floor layers. J Rheumatol. 2009;36(7):1512-1519. doi: 10.3899/jrheum.081150. 7. Meserve B, Cleland J, Boucher T. A meta-analysis examining clinical test utilities for assessing meniscal injury. Clin Rehabil. 2008;22(2):143-161. doi: 10.1177/0269215507080130. 8. Magee DJ. Orthopedic physical assessment. St. Louis, Miss. : Saunders Elsevier; 2008. 9. Chivers M, Howitt S. Anatomy and physical examination of the knee menisci: A narrative review of the orthopedic literature. The Journal of the Canadian Chiropractic Association. 2009;53(4):319-333. 10. Herrlin S, Hllander M, Wange P, Weidenhielm L, Werner S. Arthroscopic or conservative treatment of degenerative medial meniscal tears: A prospective randomised trial. Knee surgery, sports traumatology, arthroscopy. 2007;15(4):393-401. doi: 10.1007/s00167-006-0243-2. 11. Greis P, Holmstrom M, Bardana D, Burks R. Meniscal injury: II. management. J Am Acad Orthop Surg. 2002;10(3):177-187. 12. Pyne S. Current progress in meniscal repair and postoperative rehabilitation. Current sports medicine reports. 2002;1(5):265-271.